Thank you for joining our very first blog hop! If you came here from Ginny's blog, then you are on the right track. If not, go back to Tres Jolies' blog and start from there. Make sure you leave a comment on all blogs for a chance to win a prize! And, make sure you have LIKED & FOLLOWED Tres Jolie on Facebook!!! Don't forget to stop by the Tres Jolie Youtube channel and see our video reveal of all our kits. The designers at Tres Jolie have created some amazing layouts with this kit. Tres Jolie will host a different challenge each month. This month we have a mood board. You can created a layout, card or OTP project using the mood board (doesn't have to be with our kits, just no other kits please). You can be inspired by the colors or any object in the photos. Just let us know how you were inspired when you post your project. 4: Finally, go back to the Tres Jolie Blog and leave a comment letting us know how much fun you had, tell us the sentence that was created with all of the special words you collected. Can't wait to hear from you. The party continues over at Annie's blog. Have fun! Beautiful work Rae! I love the cool color palette and all the texture you added to the heart. Love your gorgeous mixed media project, Rae! The colors are so pretty! I absolutely love your project! Seriously amazing! I have been wanting to try out Finnabairs fantasy texture pastes, but didn’t know which set to get. The colors you used are gorgeous! Great mixed media kit:) Hugs from Kentucky. 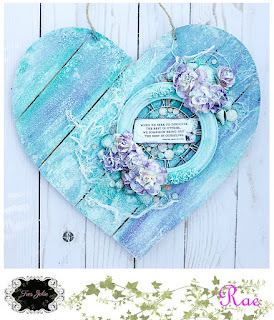 Very pretty shabby heart. Definitely inspiration to use more mixed media on my projects.